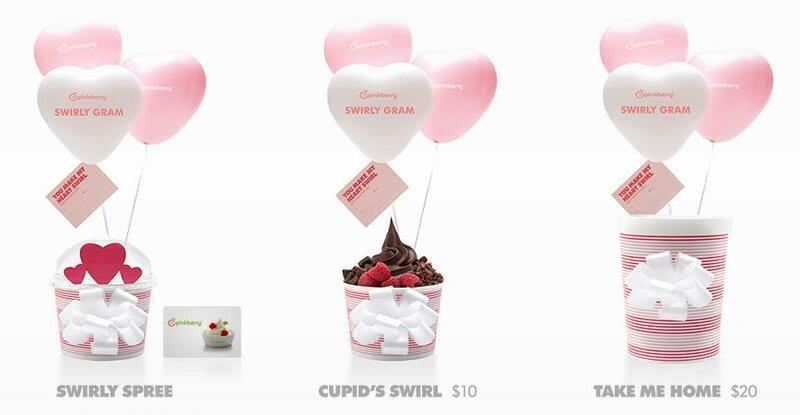 Now you can send the Pinkberry-lover in your life a special Valentine's delivery. From Feb 11-14, Pinkberry will hand deliver their famous frozen yogurt with toppings, gift card, or a take-home container of fro-yo complete with special V-day wrapping, balloons, and a note. All you have to do is go to a Pinkberry store and place your order (delivery is available within a certain radius of each store). You can also order online here, but that one doesn't come with balloons. To get you going, Pinkberry is giving away a $10 Swirlygram gift card! $10 is good for one Cupid's Swirl (prices include delivery), or pay the difference for anything else. I recommend the Blood Orange Pinkberry topped with blood orange slices. I thought about making you tell me who you're sending it to, but I don't want to embarass people, so all you have to do is leave a comment with your contact info below. Contest will end at NOON on Tuesday Feb 8th, leaving plenty of time for the gift card to be mailed to you.